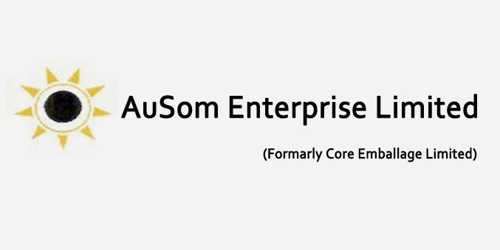 It is a broadly described annual report of AuSom Enterprise Limited (Formerly Core Emballage Limited) in the year of 2008-09. During the financial year, Total assets of the Company stood at Rs. 703,950,670 Crore. The share capital of the Company stood at Rs. 1,000,000,000 Crore. Total income of the Company for the year ended 31st March 2009 at Rs. 733,051,922 Crore. Total expenses of the Company for the year Rs. 820,031,182 Crore. Gross Profit/(Loss) of the Company Rs. 76 Lacs. Profit/(Loss) after depreciation Rs. (1295) Lacs for the year ended 31st March 2009. Issued, Subscribed and Paid-up Capital 1,36,23,552 (P.Y. 1,36,23,552) equity shares of Rs. 10/- each. Fully paid-up capital of the Company for the year Rs. 136,235,520 Crore. In the absence of profit, the Company is skipping a dividend for the year ended on 31st March 2009.